Apple's granted patents and patent applications over the last couple of months have revealed a significant interest in camera lens systems that attach to the iPhone's existing camera, enhancing its photo taking capabilities much like third-party lens attachment solutions from companies like Olloclip. 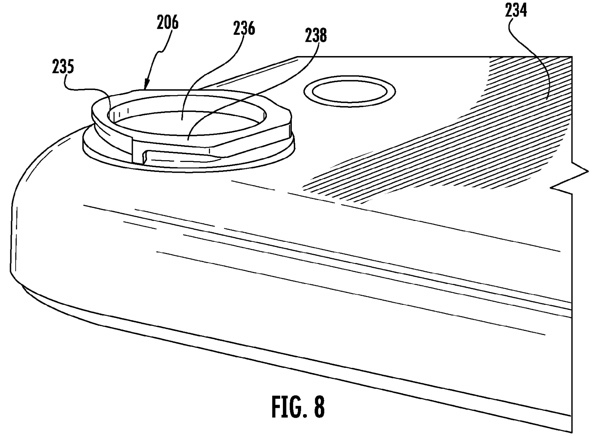 In a newly published patent application (via Patently Apple), Apple explores a bayonet lens attachment mechanism to fix a separate lens to an iPhone. Bayonet is a type of pin-based of lens mount that is designed to precisely align the mechanical and electrical features between a lens and a body in a traditional camera, preventing the components from rotating. According to Apple, this attachment method is superior to other solutions such as a separate case that lenses can be mounted to or a magnetic attachment system that may not be strong enough to keep a lens attached while in motion. Apple describes both a case and a magnetic mount as "undesirable" and "unsightly." The application explains in detail how a lens can be mounted to an iPhone or other device through a bayonet attachment, with the iPhone or other device possessing a cavity that the can attach to a lens and the bayonets being located around the aperture of the lens. It also describes quick release methods, should a device with a lens attached by dropped or otherwise damaged. Attachment mechanisms are provided. The attachment mechanisms may be configured to couple accessory devices, such as lens devices to an electronic device. For example, a lens may be coupled to the exterior of an electronic device with first and second attachment mechanisms. While there are a range of third-party add-on lenses for the iPhone and the iPad, none of the available solutions are able to use an attachment method as Apple describes due to the fact that such a system would have to be manufactured directly into the iPhone. Instead, they use magnets, cases, or other less than ideal attachment solutions that would be unable to compete with a native solution from Apple, should the company choose to pursue camera enhancements in the form of lens attachments. Apple has also explored other attachment methods in recent years, including a magnetic lens attachment system that was detailed in a patent granted in January and a similar lens attachment system that worked with a removable back panel used to swap in different lenses, unveiled in 2012. Or another Time-wasting-bait for Samsung, for all we know. Apple hasn't really done anything substantial for the niche market or the power user for a very long time now, with the sole unapologetic exception of Mac Pro. It would be better to add two or three dedicated sensor + lens combinations, and use digital zoom to implement a zoom. Another possibility might be to have a single sensor, and shift two different lenses above it. Right now the lens is around 30mm (equivalent). If we had a second 85mm (equivalent) macro/portrait lens to choose, that would be awesome. I truly believe it would be possible to fit it in the iPhone, if not this year, then next year. if you EVER have to rely on Digital zoom to get a camera feature, then the camera is bad and designed wrong. Digital zoom is the devil. DEVIL! I really can't see Apple doing this with a bayonet. They would be the ones to use magnets, as it doesn't affect the way the device looks. Magnets can be strong as hell for such small objects. its apple. They'll throw patents at the Patent office for literally anything they think of, Even if they never implement it. I see this being one of them. Maybe they'll use the idea in some other method, but liklihood you'll never see it. In other news, Canon and Nikon **** themselves with fear. Yeah I don't see the DSLR market caring too much about phone cameras. No. They don't care at all. People don't choose DSLR's over phones. They choose both. One has no effect on the other. Even hobbyist photographers are going to buy actual cameras. Hell, most parents will buy a camera for shots of their kids. This is in no way any threat to DSLR's. A macro lens would be epic. And whoever suggested digital zoom? No just no. It's guaranteed to send your photos to the trash! RAW would be great. I shoot RAW all the time on my proper cameras. I adjust every photo I take on the 5C with Camera+ to get a more accurate white balance. I can shoot a cloudless bright blue sky and it turns out a pale blue/gray color. I took it to the Genius Bar and they found nothing wrong. My older 4S had a better camera. I tried shooting raw once. The police said I had to go back inside and put clothes on.